North Korea may not have won any Olympic medals in Pyeongchang, but it took gold for diplomacy. 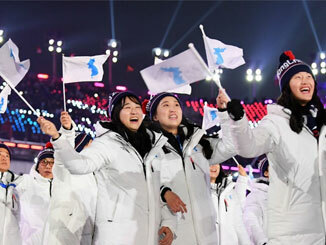 The North’s presence at the Winter Olympics was a triumph in itself, but the decisions to jointly participate in the opening ceremony with South Korea and to field a joint ice hockey team were greeted across the world as a welcome defusing of the tensions of the last year. The one major exception to this was the US. On his way to the Olympic opening ceremony in South Korea, Vice President Mike Pence announced new sanctions on the North. Then, to near universal disapproval, he refused to acknowledge the North Korean delegation – led by Kim Jong-un’s sister Kim Yo-jong – and ostentatiously refused to applaud the entry of the Korean athletes because it included the team from the North. The only result of this was to give some greater international traction to the North Korean case that it is the US that is the threat to peace on the Korean peninsula and that it is the US that is blocking talks. South Korean president Moon Jae-in was elected in May 2017 on a platform of opening up dialogue with the North. This was in conflict with Trump’s hardline policy of ‘maximum pressure’ on the DPRK; but from his election Moon had effectively dropped his softer approach in line with the behests of the US. The détente around the Olympics – which included a direct invitation to Moon to visit the North – appeared to be opening up the underlying contradictions between the approaches of the US and the South. With world opinion shifting against the US, and Pence’s behaviour widely seen as simply uncouth, the US was forced to repeatedly deny that a ‘wedge’ was being driven between the US and South Korea on their respective policies towards the North. But despite US denials, the fact is that a definite détente has opened up between South and North Korea, which may well have the result of forcing the US into talks. The way the wind had blown was demonstrated at the closing ceremony. This time, Ivanka Trump attending on behalf of the US President, was careful to be seen to clap the Korean athletes. For the North Koreans that was winning gold.